I was traveling a bit this weekend, so I'm playing catch-up now on some of the weekend's big royal events. First up: the christening of Princess Charlotte of Cambridge! 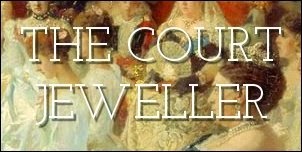 For her daughter's christening, the Duchess of Cambridge selected a set of jewelry from Mappin and Webb. The necklace and earrings are both from the company's Empress collection. Kate had previously worn the necklace in public; the earrings made their first public appearance at Charlotte's christening. Both pieces are made of white gold set with diamonds. Charlotte's great-granny, the Queen, wore her usual pearl necklace and earrings with a delicate round gold brooch that she first sported in public three years ago. The Duchess of Cornwall wore familiar pieces of jewelry -- her diamond and pearl earrings, plus a pearl choker with a diamond clasp -- for the christening. Charlotte's maternal grandmother, Carole Middleton, wore delicate earrings with a coordinating pendant necklace. Charlotte's aunt, the glamorous Pippa, wore earrings by Kiki McDonough with her off-white ensemble. And here's a look at the little star of the show herself, wearing the replica of the 1840s-era royal christening gown made by Angela Kelly. So cute!